What if we refused to be bound by the things that we all “know” to be true? What if we allowed God to be God ALL the time, rather than simply when we’ve got no better options? Those are the questions we considered in worship at the First U.P. Church on January 29, 2012. Our texts for the day included Jonah 3 and Luke 5:1-11. To make it worse, it was only a few months after we’d buried my mother. For the previous fifteen years, she’d made it her business to let me (and anyone else) know that it sure would make her happy if her oldest boy was a preacher. Now I finally had the gig, and she wasn’t there to see it. Her mother was there, her brother sang – I want to tell you it was not only a politically charged day, it was an emotional minefield. And then, on November 11th, as we began worship, the snow started to fall. And then the thunder and lightning came. I’ve never seen such a violent thunderstorm accompanied by snow, not rain. It would be an understatement for me to say that I simply wanted the service to end so I could get out of there. I had no great expectations for that day. A week later, I got a call from a professor at the local university. He wondered if he could come by and talk. Turns out he had come to the installation service out of curiosity. He was not a Christian. He’d never been to such a service before. But he said that when my sister – a young, white, female layperson – read from John 13 – because every service of installation was to have a reading from one of the Gospels – that something happened to him. He described God speaking to his heart. He would tell you that his life was changed because he heard the Word of God in the middle of that service – a service that I was hoping would end as soon as possible – a service that allowed him to hear and respond to God’s call on his life. As a result of that reading on that day, he began walking down a path that changed his job, his focus in life, and his relationships. Simon Peter lived through a similar experience. He was minding his own business when a word from Jesus changed his reality. 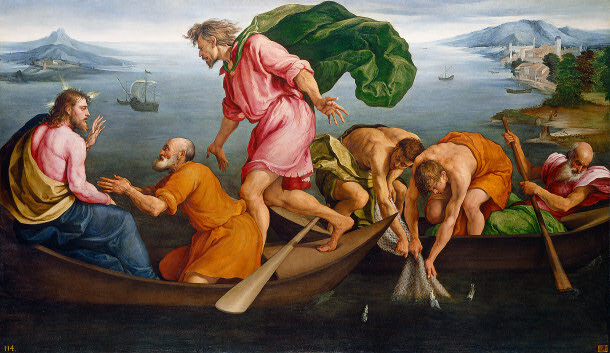 After listening to the sermon and then responding to the strange call to drop his newly-mended and folded nets into the water, he did more than bring in the catch of his life. He realized that it wasn’t just fish that he was looking for. And that word changed his world. This morning, we revisit the prophet Jonah. When we saw him last, he’d been dumped unceremoniously on the beach. He lay blinking in the sunshine, smelling like fish intestines, humbled, and newly-focused on obedience. The Word of God comes to him a second time, and the message is unchanged: Arise and go to Nineveh. And here, unlike in chapter 1, Jonah obeys. He arrives in this vast metropolis and begins to preach…sort of. If you can call a 5-word sentence fragment a sermon, well, then you could say that he preached. Seldom has there been a less-enthusiastic preacher. “Yet forty days and Nineveh will be overthrown.” That’s it. But what happens? The Ninevites hear the Word of God. And they respond! Note verse 5: it doesn’t say that they believed Jonah. No, they “believed God.” The residents of this evil city, the people we love to hate, the ones who we can’t wait to see stew in their own juices…they do what Jonah would not: they hear and accept the Word of the Lord. Did you hear what the pagan king said? “Who knows? Maybe God will spare us, and we will not perish!” We haven’t heard that kind of wild hope since the pagan ship’s captain urged his sailors to pray. If you’re keeping score, the current status is this: unbelieving outside leaders of pagan communities: 2; so-called believing prophets of YHWH: 0. The whole city fasted and prayed and repented, and we see that Nineveh, rather than being overturned, is turned around. God sees the way that they respond to his word, and does not destroy this town. Jonah, the man who carried the Word of the Lord, must be the happiest man alive, right? Well, more about that next week. This chapter is not about Jonah. It’s about the power of God’s Word to change a person or to change a people. Do you know that, church? Do you know that the power of God can change hearts and minds? Do you believe that God can reach into the most dismal places and bring forth change and hope? I don’t do this very often, but can I have an “Amen”? Do you believe that? I’m not so sure that when push comes to shove we really do. My sense is that most of us go through life trusting in God and God’s power when it makes sense to do so. We believe God has our back, all right, but every day we go out into the world and rely on our own talents, skills, and abilities. After all, we know that “the big guy” is there if we need him, right? The obvious implication of that phrase, of course, is that most of the time, most of us don’t really need God. It’s nice to know that he’s around, of course, but, well, don’t call me, God, I’ll call you. Mark Twain once commented that there are some people who have “the calm confidence of a Christian with four aces.” It’s not that we don’t believe in God – it’s just that we think that most of the time he’s unnecessary. Yet today’s scriptures reveal fishermen and Ninevites who have no claim to competency, ability, or favored status yet who are somehow able to hear the Word of the Lord – and in that hearing, their worlds are rearranged. You can search the scriptures for a long time, and I don’t know that we’d be able to find a prophet more removed from God’s purposes than Jonah writhing in the belly of that great fish; or a community more alienated from God’s call than Nineveh on the day that Jonah finally showed up, or an apostle with a greater sense of God’s claim on his life than Simon Peter. Each of these heard the Word of the Lord at a time when they realized that they had no one but God. God came to them in the midst of the worst…and spoke them into a place where they could never have imagined themselves. Today, I’d like to invite you to ask God – that same God – to speak to you. Not to the plans you’ve already made, or the abilities you’ve carefully nurtured, or to the resources you’ve got at your disposal. Don’t ask God for a little “pick-me-up” or a boost or an encouragement. Instead, call out to the One who commands whales, who changes hearts, who speaks and calls creation from nothingness. Ask God, if you dare, into your emptiness and brokenness. Ask God to strip away the places in your life where you are simply satisfying the requirements and nothing more. Ask God for what you need, not what you want or what you like. So what are you saying, Pastor Dave? That if we ask God into those places, that the world will change? Hey, it could happen. So far as I can tell, that’s about the only times it has happened. God bless you. Amen. 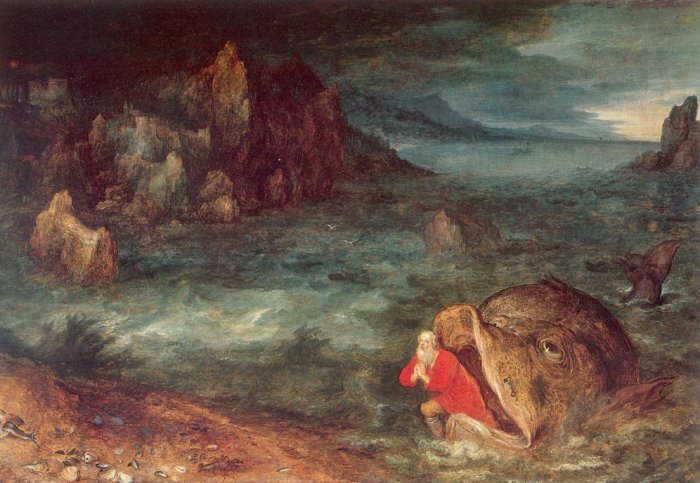 A continuing exploration of the story of Jonah and its relevance for our lives today. Texts for this message include Jonah 1:17 – 2:10 and Mark 10:46-52. This message was preached in the Crafton Heights Church on January 22, 2012. 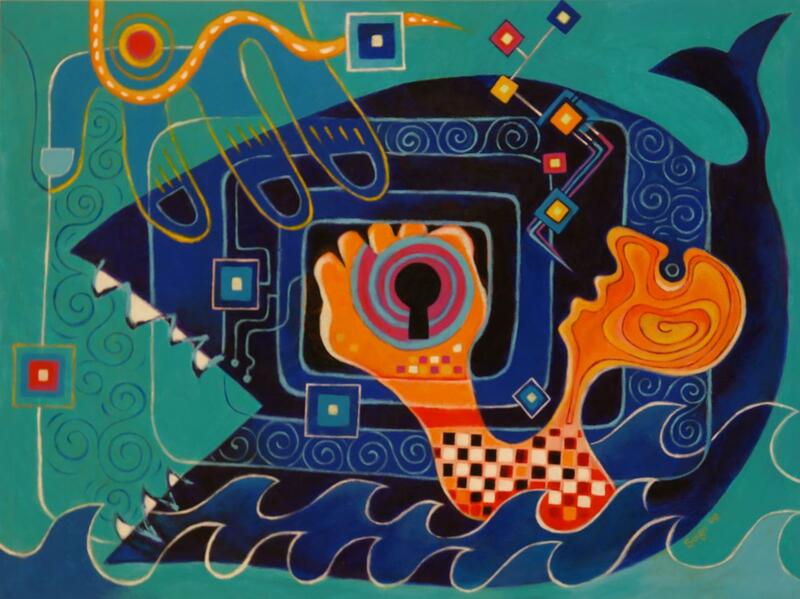 Last week, we began to explore the story of Jonah. This man is a real paradox. He’s a prophet, meaning he’s received the Word of the Lord – but he won’t prophesy. Chapter one of the book that bears his name narrates how he hears the call from God to “Arise, and go to Nineveh”, but how instead he goes down to Joppa, down to the shipyard, and eventually, down into the sea. The last thing we saw last week was the big splash that Jonah made when the sailors, following orders from both God and Jonah, threw the prophet overboard. 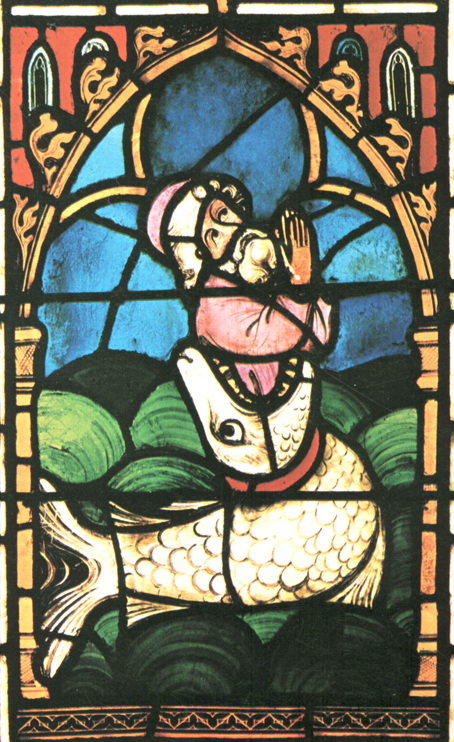 Today we see where the Lord provided a great fish that swallowed Jonah, and he survived in the belly of this fish for three days and three nights. 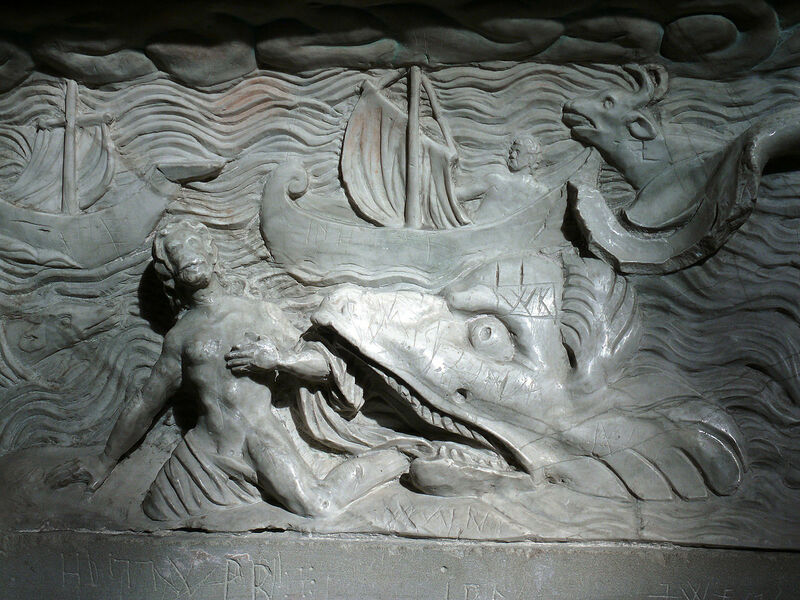 Detail from a relief showing the story of Jonah from a tomb at the Saints Peter and Paul church in Köngen, Baden-Württemberg, Germany. About 1615. You see, it begs that age-old question: what is the appropriate amount of time one should wait between getting tossed overboard into a raging storm, sinking down into the sea, being swallowed by a ginormous fish…AND prayer. I realize that there are really no instruction books for this kind of thing, but is there a protocol involved? You know, like you’re supposed to wait half an hour after eating before swimming, or wait 24 hours after you color your hair before you wash it… What is the appropriate time to wait? You get thrown overboard, the fish swallows you…how long until you pray? Jonah waited three days. Why would he do that? Or maybe, as we discussed last week, he was hopeless. He was resigned to the fact that it was merely a matter of time for him, and when he felt the fish swallow him, he just hunkered down and waited for the end, never thinking to pray. And I suppose that it could be that he was simply out of practice – we didn’t see Jonah pray at all in chapter 1, so maybe it just didn’t occur to him to open his heart to the Lord. You’re probably right…as far as that goes. But I can just about guarantee that you will be swallowed by something. It may not be a disaster at sea, but you will face shipwrecks and storms in the days to come. There will be crises of health, in your family, at your work; you will be shaken to the core of your being. And when those things engulf you, how long will you wait to pray? It seems to me that Jonah chapter two has a word for anyone who has been, is, or will be flailing in the darkness or gasping for breath. This is the prayer of one who has absolutely hit bottom. Did you hear what Jonah said? He cried to the Lord in distress…when the waters closed in over him…and the deep surrounded him…the bars closed in forever…in fact, he says, his very soul fainted. The life was ebbing from him. This is not the prayer of a man in a position of strength. In Jonah 1, the storm rages on, and what does he care? He’s a man who knows where he’s going, he’s got a plan…the sailors are fighting for their lives and he’s down below sleeping like a baby in the belly of the ship. That’s not prayer. True prayer is the realization that God, and God alone, is able. God does not need Jonah’s – or my – approval. God does not need Jonah’s – or my – resume. God is God, sufficient in and unto himself. He’s not waiting around to give the ok to any swell ideas that I might have. What God is waiting around for – to the extent that God actually waits around for anything – is to hear Jonah, or me, or you, say “OK, God. I’m ready now.” And when Jonah says that, the fish spits him up onto the beach. It’s not particularly his finest hour (although I suppose that the whale is not entirely upset about the whole experience…). Jonah’s prayer ends with a statement of faith: Deliverance belongs to the Lord! In our Hebrew Bible, that sounds like this: yeshuata leyahweh. Deliverance belongs to the Lord. Archaeologists have unearthed this rare find from the ruins of the synagogue in Nazareth. OK, not really. But what if??? Let me remind you about the Hebrew that you’ve learned. What does Yahweh mean? It’s God’s name, right? God is Yahweh. The other word, then, yeshuata, must mean deliverance or salvation. You know this word, or a part of it. Yeshua. Remember in Matthew 1, when the angel told Joseph what to name the baby? Yeshua. 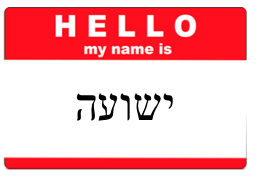 When Joseph and Mary’s boy went down to coffee hour at the synagogue, he wore a little nametag that said, “Hello. My Name Is Yeshua”. And that leads me to consideration of the Gospel passage that you’ve heard today, because it, too, is an apt model for prayer. Those around him try to hush him, but what does he have to lose? He cries out louder. And then, when Yeshua calls to him, what does Bartimaeus do? He sprang up. How often do you see a blind person move quickly? That’s a recipe for danger, isn’t it? Better to be cautious…but not Bartimaeus. He springs up and tosses aside his cloak. Another rash decision. How is he going to find that once this Yeshua character is gone? But he throws it away – his only place to hide, the only protection he has from the wind and the sand and the spittle and who knows what else – and he tells Yeshua what he wants more than anything else in the world. He does not ask for money, although that’s apparently what he’s always done. He does not ask for food or safety, or a nicer cloak. And he is healed. And then, Bartimaeus is faced with the same choice as old Jonah laying on the beach. Where should he go? 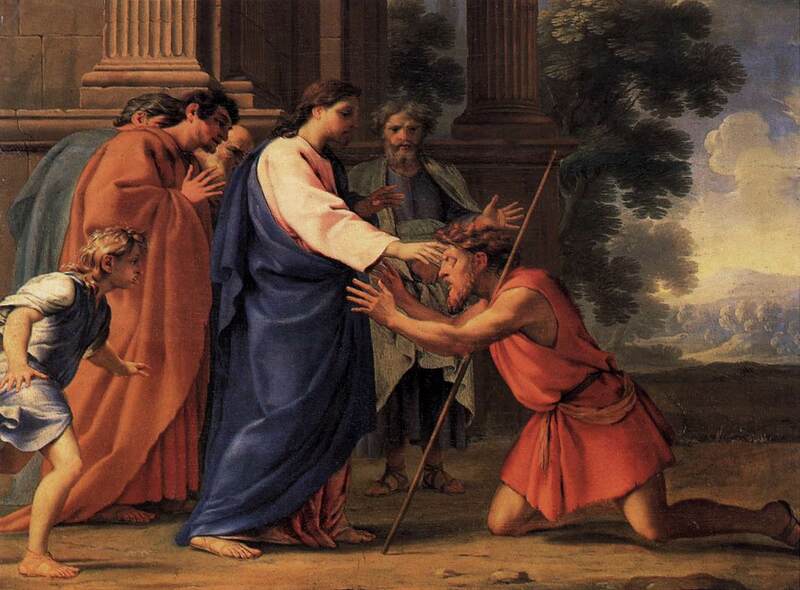 Bartimaeus followed Yeshua. Jonah started walking towards Nineveh. Each of them cried out in the darkness, and then followed the voice that had called to them. One of the holiest aspects of my calling is sharing prayer with people who are crying out to God in the darkness. My phone is hardly ever turned off…partly because I’m such an extreme extrovert, but mostly because I can’t sleep if I think that you might be alone in the dark. It is a sacred trust and privilege to wait with you in the hospital, or at the prison, or by the grave. It is a holy responsibility to sit with you in places of emptiness and death. And I do not for one second want to discourage you from crying out to Yeshua or to your pastor from those places. But I wonder in what ways you and I might empty ourselves and come to God before the deeps close in around us? After all, if Jonah had been in contact with God from the beginning, then he wouldn’t have been thrown overboard – he couldn’t have been thrown overboard, because he’d be nowhere near the water as he hiked across the desert from Israel to Nineveh. And I am not speaking for anyone but myself here – but I know that there has been a lot of pain and isolation that I could have avoided in my own life if I’d have simply turned to God in my emptiness and brokenness, rather than resting on my strengths and pretending that I had it all under control. Now listen: I am most certainly not saying that as long as I pray – even from my emptiness – that nothing bad will happen. I promise you that the storms will come and the deeps will close in around you. What I am saying is that if we develop a lifestyle of prayer and a willingness to come to God as empty-handed as Bartimaeus and Jonah, then when we get tossed from the boat or voted off the island or pushed into the sea, it won’t take us three days to find our voices. The dark and the deep will come – but they will have no power to overwhelm or defeat us. If we face each day remembering that we stand naked before God, empty except for what he puts into us, then yeshuata leyahweh is never three days away. The bad news is that your deliverance, your salvation, does not come from you. You cannot tread water forever. The good news is that you do not have to. Come to God in your emptiness and in the darkness, and ask him to change you. 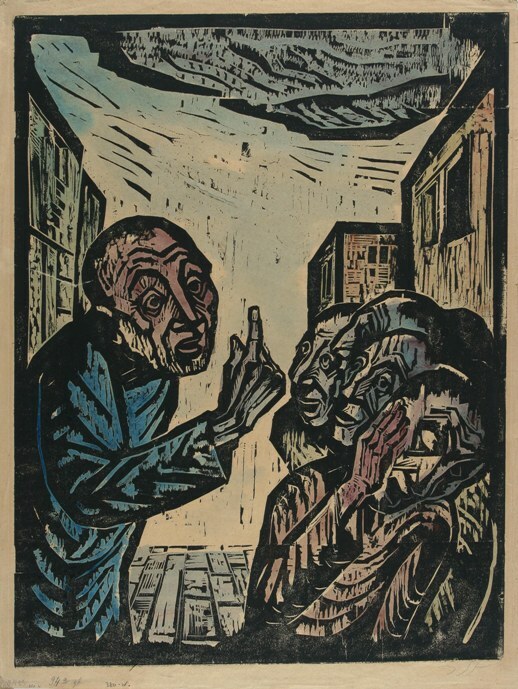 Yeshuata leyahweh. Thanks be to God. Amen. What does it mean to be a “prophet”? Are you called? Have you ever tried to run from God? Jonah. That’s the book that is loved by generations of Sunday School teachers and Bible School Directors. It’s a great story – for kids. Lots of adventure, imagination, and energy. But when we grow up, we are confronted with “science” and “truth”. We come to learn that by and large, people don’t survive underwater very long. There aren’t many, if any, fish capable of swallowing a grown man. There’s no evidence in the archeological record of a great religious revival sweeping through Nineveh. Listen to me: the Bible is no more interested in trying to convince you that Jonah is historical fact than Shakespeare is trying to teach Danish history while writing Hamlet. In the book of Jonah, the Bible is telling a story. More than that, the Bible is telling the truth. 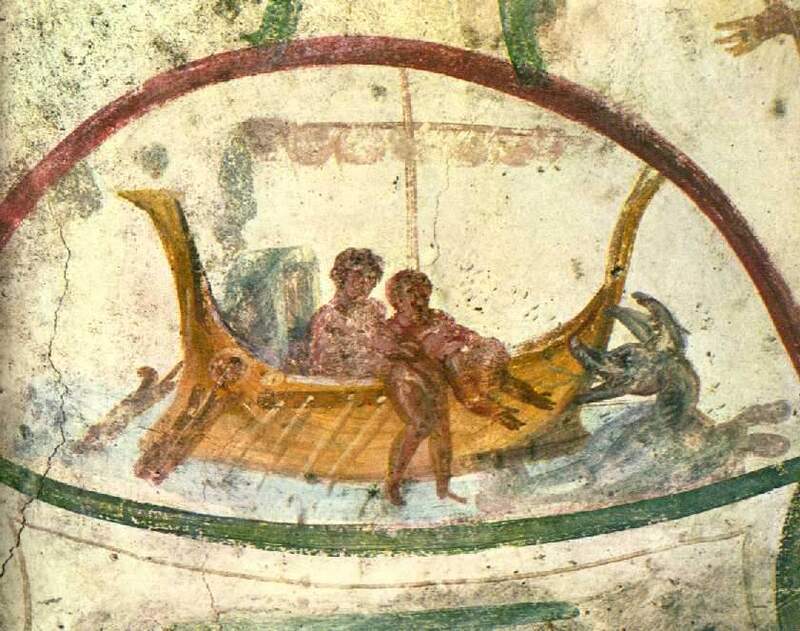 I am here to tell you that the author of Jonah is no less an artist than Shakespeare or Twain or Hemingway – using a story to tell us the truth. Jonah is not just for Sunday School kids. It’s for you and me. So what happens in the story? Well, for starters, the Word of God comes to Jonah. That means that Jonah is a prophet. Of all the people in the children of Israel, Jonah is called to listen to and to speak the Word of the Lord. It is a singular honor and a profound responsibility. It is a high office. And he has no interest in serving in that office! 1 Woe to the city of blood, full of lies, full of plunder, without victims! 2 The crack of whips, the clatter of wheels, galloping horses and jolting chariots! 3 Charging cavalry, flashing swords and glittering spears! 4 all because of the wanton lust of a prostitute, alluring, the mistress of sorceries, who enslaved nations by her prostitution and peoples by her witchcraft. Oh, yeah…we really, really don’t like those guys. Asking a Jew to go to Nineveh in the time when this story takes place would be like asking a survivor of 9/11 to take relief supplies to an Al Qaeda village in Pakistan, or asking a Holocaust survivor to lead a mission to Germany in 1949. Yet oddly enough, that is the call of God – “Arise, and go to Nineveh”. And what does Jonah do? Well, he heard the Word, all right, but instead of “arising” and going to Nineveh, this is one long descent. 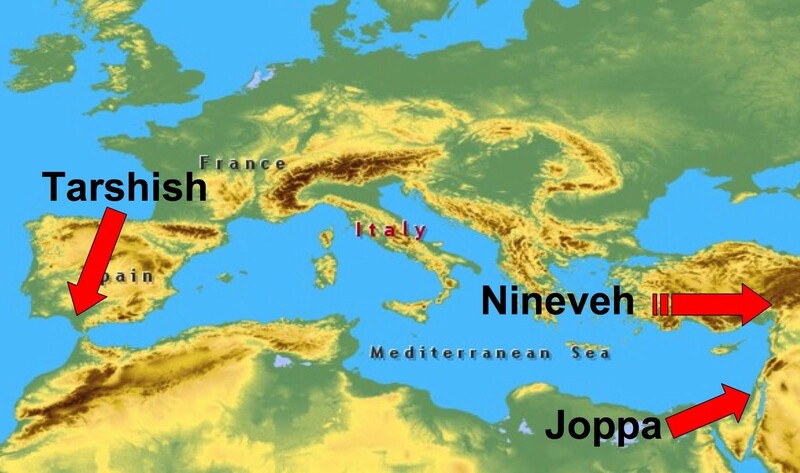 First, you need to know that Nineveh is North and East of Israel, over land. Tarshish is West, and over water. But even if you didn’t have a handy-dandy map to help you, the narrative is full of clues that Jonah has no interest in following the call of God. Did you hear where Jonah, who was told to “arise” and go up to Nineveh, was going? “Down” to Joppa (1:3), “down into the hold of the ship” (1:5) where he “laid down” (1:5). Eventually he went down into the depths of the sea (1:15) where he went down into the belly of the fish and even down into Sheol, the underworld (2:2). God says, “Arise, and go up” and Jonah spends all of chapter one and most of chapter two going down, down, down. And yet God does not let Jonah go. God chases Jonah. God has a purpose for Jonah. The sailors on the ship are unaware of this, of course. All they know is that ever since they met this Jew, their lives are a lot more difficult. I want to say that again, because there’s a lesson there – that innocent bystanders find that their own survival is imperiled because one of God’s own people was walking away from the call of God. It’s important to remember that there is precious little that is actually simply between me and the Lord. Oh, I love to “come to the garden alone, while the dew is still on the roses”. I hope he walks and talks with me. But the truth is that my ability and willingness to listen to and follow the call of Jesus – or my unwillingness to do the same – will have huge consequences not just for me, but for the people around me. This is especially important for anyone in a position of leadership to remember! The sailors are paying the price for Jonah’s disobedience. Who pays for it when you run from God? Who pays for it when I ignore God’s call? The sailors, who are my favorite characters in this part of the story, respond to the problem just about like I would. They don’t want to face it. Their solution is to keep on doing what they’ve always done. When they discover that this entire storm is Jonah’s fault, what do they do? They row harder. They try to sail better. Isn’t that human nature? We find ourselves in a difficult situation, and we simply do what we’ve always done a little more frantically, a little faster, a little harder. But finally, it dawns on them that this is business between God and his prophet, and so they pray for forgiveness and then toss Jonah overboard. Did you hear that? In the book of Jonah, who prays first? The prophet, who is called by God and given the Word of the Lord? Nope. We see that it is the pagan sailors who actually talk TO the Lord. So far, Jonah is only willing to talk ABOUT the Lord. It’s the sailors who wind up doing the worshiping in chapter 1. This morning, we stand on the brink of a New Year in several ways. It’s January. We are ordaining and installing leadership for the congregation and inaugurating a new ministry. Is there anything for us in Jonah chapter 1? Let me tell you that you, no less than Jonah, have received the call from God. Listen: Jonah, or Moses, or Abraham, or David, or Ruth, or Esther would love to sit where you are sitting! They would love to have the resources that you have. You have the Bible – a written record of God’s movements in and call to his people. You have the sacraments – signs and seals of God’s presence with and grace for his people. You have the gift of the community, the body of Christ – a flawed and imperfect people, perhaps, but nevertheless shaped by thousands of years of relationship with the Lord. You have more access to the Word and call of God than most humans who have ever lived. You have the call! Listen for it. And Act on it. “Oh, no, Pastor, I wish! I used to think that. I would like to think that, but you see, it’s complicated. I can’t. Not anymore. You see, I got divorced. The baby died. There was trouble at work. I got to drinking. Something happened, Pastor, and now I’m disqualified. I’m not good enough. I can’t speak for God. Sheesh. It’s about all I can do to speak with God. Really? Seriously? You want to look Jonah in the eye and say that your flight from God is worse than his? You want to say that somehow, you’ve managed to screw things up more royally than he did? I doubt that. But even if that were somehow the case, we have the testimony of another gigantic screw-up – a follower of Jesus named Paul, who wrote to his friends in Romans that there was nothing – nothing – that could separate us from God’s intentions for us. The God who pursued the reluctant prophet, Jonah, out to the middle of the ocean and who finally got him where he could hear him is the same God who will go anywhere, everywhere, any time, all the time to get to you. Nothing will stop him. Not even you, I don’t think. There’s a word here for those who would step forward as leaders in our ministry. You may or may not have ever felt like a prophet before, but the reality is that you have the Word of the Lord. And like Jonah, you are charged, first and foremost, to listen for that Word. And after you’ve heard it and reflected on it, to follow where that Word takes you. And today you are accepting the added responsibility to lead the rest of this bunch into a place where we’ll be better able to hear and to follow for ourselves. But this is not only a word for leaders. The rest of us are also called to pay attention to where God is. Like the sailors helped Jonah to hear and respond to God’s movement in his life, we are called to remind those around us of the presence of God in every place. And just as the sailors had to give up striving to do the same thing faster and better, there may be something in your life that you need to change in order to find a better way of serving and following. God is calling you. God is sending you. God is calling and sending us to proclaim truth, and hope, and love, and mercy, and grace, and justice. You are not disqualified from that call. And you cannot hide from it. So let us arise. And go. And speak and live truly this day. Thanks be to God! New Year’s Day 2012 began with worship in Crafton Heights. We sat under the familiar story of Simeon in Luke 2:21-35 and considered the encouragement of the unnamed apostle in Hebrews 10:19-25 I’m not one for “resolutions”, but I like a good dare every now and then. How about you? Will you join me? When you take a child to an amusement park for the first time, what’s the one ride that you expect to go on? I mean, if it’s little Billy’s first trip to Kennywood, do you get in line for the Phantom’s Revenge right away? Probably not. My hunch is that you head for the carousel. You might choose one of the horses, or the lion or tiger on the outer row. Or perhaps you’d opt for one of the “jumpers” on the inside rows. Or, if the excitement was just too much for you, you’d choose one of the benches. I know that this is a pretty subjective issue, but for my money, the carousel is the worst ride in the amusement park…but every park has one. Why is that? Why do people like them so much? My hunch is that we like them because they are predictable, they are safe, they are pretty, they are shiny, and they are loud. And most of us have a fascination, if not an appreciation, for the predictable, safe, pretty, shiny, and loud things of the world. 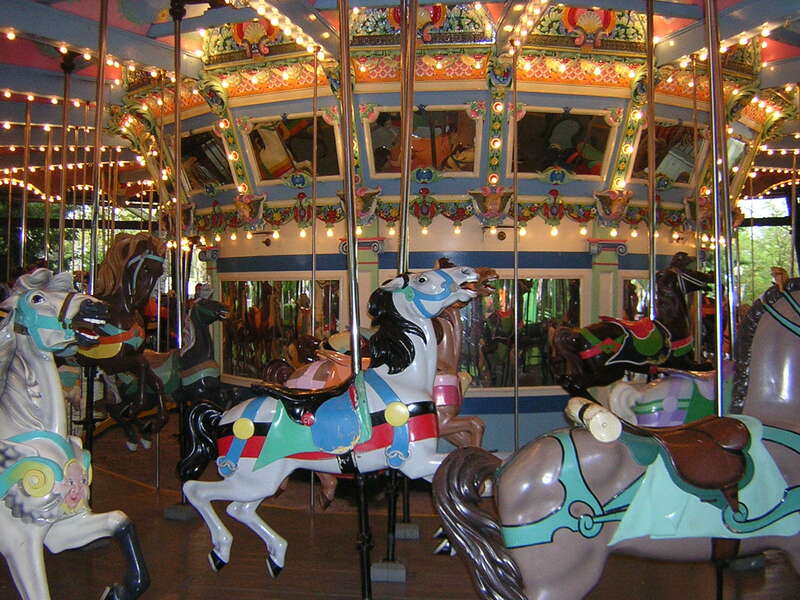 The reality, of course, is that while we call the carousel a “ride”, you don’t really go anywhere, do you? There is a lot of noise and movement but no actual transportation. For too many people, life is like that – a seemingly endless stream of meaningless encounters of the same stuff on different days. Do you remember the 1993 film Groundhog Day? Bill Murray stars as Pittsburgh television weatherman Phil Connors who seems doomed to repeat the same day over and over again. In one key scene from that movie, he turns to Ralph, at the bowling alley, and says, “What would you do if you were stuck in one place and every day was exactly the same, and nothing that you did mattered? That’s not how it’s supposed to be, or course. And it surely doesn’t need to be like that. What if instead of seeing our lives as revolving around atop a meaningless and changeless platform, we actually got somewhere? What if instead of feeling like we were spinning our wheels, we were able to live with the conviction that we were going higher up and deeper in every single day? I’m going to ask you to leave the merry-go-round and come with me to the lighthouse. 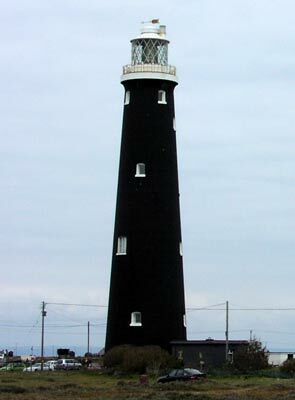 Have you ever been to visit a lighthouse before? Let’s take a walk around the outside, at the very base of the structure – and it’s a circle, just as we made on the merry-go-round. As we walk, which directions will we cover? North, East, South, and West, right? The same exact directions traversed by the carousel. As we walk around, what do you see? Water. The Beach. Rocks. Trees. Now, let’s go inside. 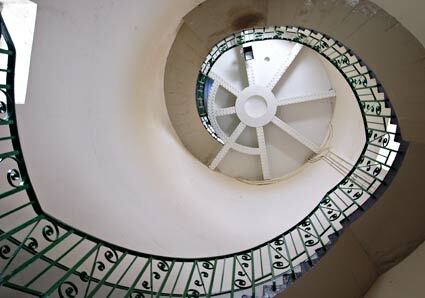 Look up, and you’ll see that big circular stairwell. And there are windows looking out in all directions – North, East, South, and West. Let’s climb the steps, pausing to peer out of the windows in the directions we’ve just looked when we were on the ground. What do you see when you look out the windows? Water. The beach. Rocks. Trees. We see the same things that we saw when we were on the ground, don’t we? Or do we? What happens as we climb? The perspective changes. We see the horizon differently. The shadows and the colors play out differently. We appreciate the topography a little more. So what’s the difference between the lighthouse and the merry-go-round? 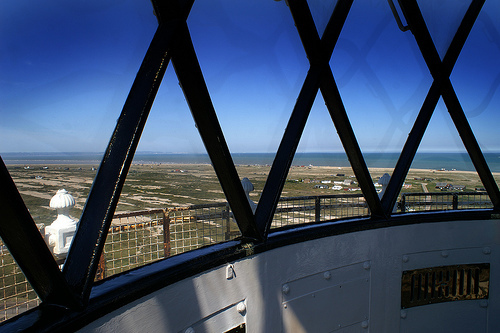 While both involve 360° views, in a lighthouse, you’re actually getting somewhere. The views are similar, but not the same. Your perspective on reality changes as you climb. Oh, and another thing: the lighthouse is a lot more work, isn’t it? There are no benches in a lighthouse. Our Gospel reading for today offers us a lighthouse perspective. When Jesus is only 8 days old, his folks bring him in dedicate him. 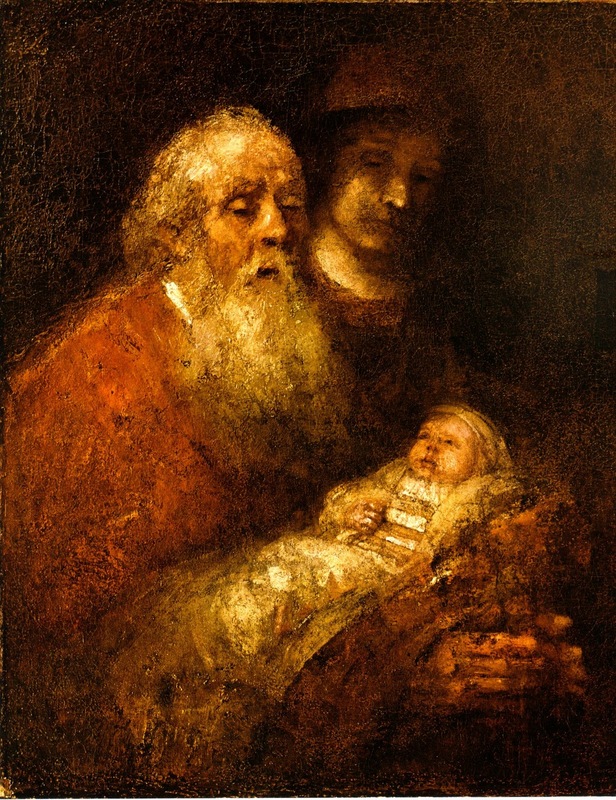 Simeon takes the little screecher and sees him, not as “just” a baby, but as the Messiah. He is filled with the Spirit of the Lord and makes predictions about the life of the baby who rests in his arms. Simeon sees Jesus as the new thing that God is doing in the world. Think about all the folks we’ve met around the manger this Christmastide. It seems to me that of all the people who greet the Lord, it’s Simeon who has the gift of perspective. The shepherds hear a snappy song from heaven and they come looking for the one of whom the angels sang. The wise men saw the shiny light in the heavens and followed the star, and came to see where the baby was laying. By and large, these folks were essentially tourists who were brought in to see a wonderful sight. But Simeon recognizes Jesus when Mary and Joseph bring him in. For his entire life, Simeon’s been climbing in the lighthouse of God’s dealings with his people, and he’s therefore able to recognize God doing something new in a way that the other people cannot. Simeon’s practice of going to the temple, of participating in worship, of seeking the holy every single day, have brought him to the place where he’s able to recognize and celebrate the gift of God’s son while that same son is wearing only diapers and unable to speak. Simeon’s perspective gives him wisdom and insight that the shepherds and wise men do not have. This morning I’d like to issue a challenge to each of you – to make 2012 a “lighthouse” year. Let me encourage you to get off the merry-go-round and take the opportunities to look for God’s perspective on the events of your daily lives. Think about those newsletters that we send out at Christmastime. You know, the one or two page notes in which you announce to your friends which relatives have made the honor roll, which are eligible for parole, and which are simply taking their toll on you. We send one of those out most years, and the last time that New Year’s Day fell on a Sunday was 2006. In my letter for 2005, I dared my readers to go to church on January 1. I predicted that the place would not be crowded and that it might be as good a place as any to start the New Year off right. Imagine my surprise when early in 2007 I got a letter from “Darlene”, who had been a member of a youth group I led in the early 1990’s. She and her husband were living in the Midwest, where their lives were comfortably hectic as they pursued graduate degrees, paid off student loans, and simply enjoyed each other. Darlene went to church on January 1, 2006, and she took her husband. They’d grown up in different places, both spiritually and geographically. It took them some time to find a worship space that was comfortable and challenging to both of them. But they found one. They joined that church. They had a baby, and baptized her. She wrote me a letter, more than a year after the fact, to simply thank me for daring her to go to church. Her belief was that her world had changed as a result of the perspective she gained from acting on that dare every week. So in that spirit, I have a dare for you. I can’t simply follow Hebrews 10:25 and dare you all to come to church, because, um, well, you’re already here. While that might be the easiest New Year’s resolution you’ve had for a while, to me that’s a lot like sitting on the bench at the merry-go-round. It’s just too easy. I dare you to act on this in the next twelve months. What would our lives and our community be like if we, as a congregation of a hundred or a hundred and a half people decided that we were going to be intentionally affirming in our communication with and about each other? What would happen, do you suppose, if we chose to be direct and honest in our relationships, motivated by love and seeking the best for each other? I dare you to expect the best from the people sitting next to you this year – and to tell them that. And to help them get there. I dare you to “provoke” each other to behaving in loving and affirming ways. So bring a friend to worship. Sit next to someone you don’t know. Talk with your brother about how he decides to spend – or give – his money. Show up at a service project. Help out at the after school program. Read the Bible. Pray. Come to Faith Builders. A lot of people I know tell me that they can’t read while they’re riding in a car or on the bus. There’s something about the motion that distracts their concentration, or invites them towards nausea. How often do you see anyone reading – or praying, or contemplating – on the carousel? Not often. It’s too hard to be looking deeply for meaning and purpose when the world is so loud and is whizzing by and it’s about all you can do to reach out for a glimpse of grandpa every now and them. But in the lighthouse, it’s a little slower. A little quieter. And you can stop to read, to talk, to pray, to think if you need to. So come in, and take a look around. And encourage someone else to climb in with you. I dare you. Amen.